Sorry folks, but this post is not for the squeamish (or for kids with Elf on a Shelf “narcing” on their every move to Santa). Over the years, I’ve made a few posts that might have concerned some people and assuredly typed out a few sentences that might have made a few readers raise their eyebrows. Some of that is by accident, or more likely intentional (always keep your readers guessing). Most of the time someone will call me on it and make some clever comment…. and then there are those times it just kind of slide by apparently unnoticed. Those are the situations that are most intriguing to me. Has my reader base defected? maybe it was too subtle or worse, readers are starting to associate these situations as “normal” for me (eesh). As prime example, take a previous post on the Halloween decorations (link here). In that post I was recounting how difficult it was to get ready for our annual Halloween party due to all the activities that were swirling around at the time. Let’s recall the following sentence from that post, “Oh, on Tuesday I had to dispose of a body… but more on that in an upcoming post.” I distinctly remember hashing over that sentence a couple of times and was kind of feeling bad since it was an obvious ploy to generate more comments to pad the year end summary – that is due shortly. Guess how many comments I received as a result of that specific line? 20? 10? 5? NOPE – NADA. Apparently disposing of a body is less controversial than letting my wife become a Peter Lik groupie. The good news is this post is the referred to “upcoming post” and therefore I can set the record straight. I’m not kidding about the queasy nature of this post so if you can’t stand a little bit of gore I recommend shielding your eyes – maybe read it through your fingers to cut d0wn on the exposure – don’t forget to hold your nose at the same time. Proceed whenever you feel comfortable. 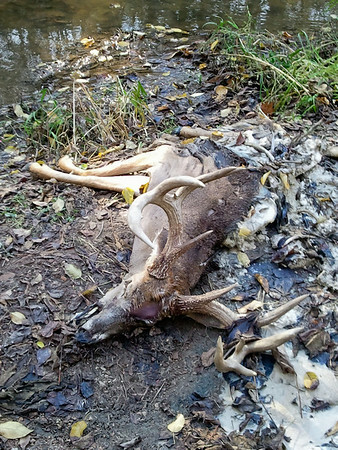 There laid what was once a beautiful buck (still with me?). Based on the state of the bones the body had been ravaged by coyotes. Add the length of time it had been laying there along with the heat left one hell of a mess. A quick assessment determined someone had shot it with a bow. I do not allow hunting on my property, but there are tree stands up on the three properties that border mine. One of them lost a mighty fine buck and each of them know I would have allowed them to come on my property to retrieve it without hassle (as long as they didn’t actually shoot it on my lot – if that was the case there would be some serious discussions). Eventually the stench got to me along with the disgust that this fine specimen was just wasted. Another task for the to-do list as if it was not already full. What was to come ended up being one of the most horrifying experiences in my life. With the antlers off it was time to tackle the rest of the body – beyond the head and front legs it was pretty much reduced to soup anyway so my first impression that this would be easy didn’t seem that far from sanity. Out came the wheelbarrow, plastic and shovel. Admittedly, I am not the strongest person around (especially after retooling the body from martial arts to running) but I am also not the weakest. I stuck the shovel under the head with the intention of flipping it in the wheelbarrow. There was no flip. It took absolutely every ounce of strength I had to lift that head off the ground along with the front feet. There was visions of the shovel snapping in half the way it was bending. By some miracle it was lifted over the lip of the wheelbarrow and slammed down on top of the plastic. A little extra work and the dangling front legs were slid in alongside the head resulting in a horrific pose that was almost worth taking my gloves off to take a picture…just so my readers could experience the hell I was dealing with – be glad you were spared. I had to be 50 minutes plus into this by now. The next 15 minutes was spent scooping up the soup and bones and dumping it in the wheelbarrow on top of the head. The light was beginning to fade, but from what I could tell, the shovel step was done. I rested the shovel next to the antlers and turned back to start hauling the mess deeper into the woods. 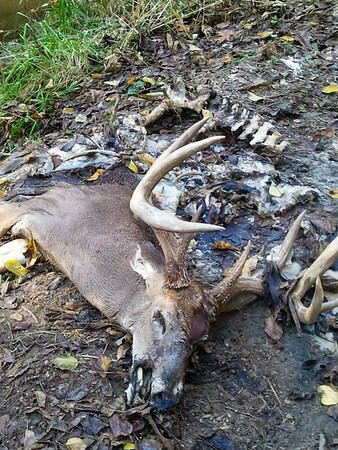 Every have one of those days – you know, when you are out in the woods at night, shoveling up liquid flesh and staring into the skull of a once proud buck now covered with maggots while doing all you can to ignore the vile stench thinking “This really can’t get any worse”? No? maybe you need to get out more hehehe. The bad news is it CAN get worse and it DID. It only took one step toward the wheelbarrow when it starting to tip. I grabbed the closest handle and with all my might tried to stop it from going all the way over. The extra soup and dirt was too much for me and the vulgarities spewing out of my mouth was not giving me superhuman strength. Over it went causing the plastic to slide out and the carnage to flow out like a vat of cottage cheese. For some stupid reason I tried to grab the ends of the plastic and drag it back inside the bucket – even if that was successful there was absolutely no way I could pull the barrel back upright. Experience has taught me when you feel trapped by a task it is best to just attack it and break it down into a bunch of little goals that can be achieved with mindless brute force – a technique that has served me well on long races when the end seemed like an eternity away. The wheelbarrow was stood up and the head wrestled back into the now plastic free bucket. This smaller load was then hauled deep into the woods and dumped by a tree with the hopes it was far enough away from the trail that the stench wouldn’t reach it. This act was repeated 6 more times until the area was once again cleared. Not wanting to deal with the wheelbarrow or plastic I wheeled it all out into the back part of my property and dumped it. By now every piece of clothing was soaked in sweat – oh, and the flashlight was dead which was probably best since this meant I couldn’t really see the antlers very well while stuffing them into the bags. Not sure I’ll forget that experience anytime soon. Once back at the house I took off my clothes in the garage threw the boots and gloves directly into the garbage and went inside to scrub every inch of the body with a Brillo pad. On my way past Linda I calmly informed her she has nothing to worry from me because I would NEVER be able to dispose of the body and proceeded to the shower. If there is a bright spot in all of this, the rest of the tasks on the list didn’t seem that bad anymore – what’s a half marathon (link here) compared to 3 hours of wrestling with a dead deer. Maybe the reason I for one didn’t respond to your remark about having to dispose of a body is that I once had to dispose of a dead bird, and another time a dead toad. So I know exactly what you mean. I think if it were me, I would have dragged that deer and shoveled all that soup into the creek next to it and forgot about it. Those are magnificent antlers, but too bad. But thanks for the gruesome Christmastime story. Very Tarantino-esque. It also brings to mind the wood chipper episode in Fargo. I assume the toad croaked … Bada – Bing. somehow neither of those seem to have the same level of gruesomeness, but I can completely understand the the impact on a city boy (hah). You are probably the 20th person who has told me to simply shovel it into the stream – note, half said to take the antlers off first. Just seemed wrong with all the damage we humans are doing to the climate and the fact I keep seeing kids play in the muck of the stream through Jubilee made me cringe a little at the thought – mine stream is a major feeder into that (personally traced a mile of it last year). Truth be told, the spine did go into the water. Hey, give me some credit, I waited until after Christmas – didn’t want everyone having to explain why there was a missing deer on Santa’s sleigh. Eesh, I can still see that vacant stare when I close my eyes.. that and the gaping whole in the skull from the saw. Probably a good thing I did not become a mortician.